My country, Canada, is celebrating its 150th birthday this coming Saturday (July 1), so I thought I would dedicate today’s post to Canadian travel, most specifically to three midsize Canadian cities that may be just what you need for a solo trip. As a world traveller, you’re probably familiar with our three largest cities: Toronto, Montreal, and Vancouver. However, not everybody loves large metropolises. And even for those who do, there are advantages to visiting smaller towns and cities sometimes. For one, you can get around quicker and spend less time on public transit. It’s also easier to strike conversations with strangers, something that would feel odd in Toronto. And you can quickly become a regular in a restaurant or coffee shop by showing up a couple of times. Last but not least, accommodation costs are likely to be lower than in larger cities. Here are three of my favourite midsize Canadian cities, which all happen to be provincial capitals. They’re big enough to have public transit and plenty of things to do, and small enough that you’ll feel comfortable visiting on your own. With 403,000 inhabitants (317,000 in the urban area), Halifax feels like a small big city, or a big small town, depending on your point of view. Although you can walk across the entire urban centre in less than an hour, it offers plenty of things to do, eat, and drink. 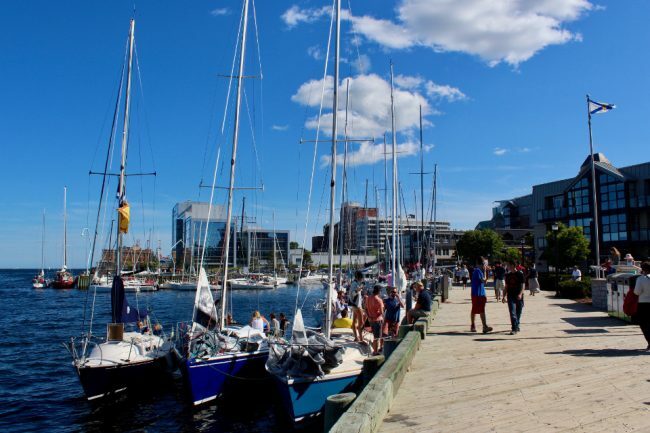 As the capital of a Maritime province, you’re never far from the water here, so it makes a relaxing summer destination where temperatures are never too high. Walk the length of the Waterfront Boardwalk and watch the sailboats, or the people partying and barbecuing in their anchored boats. Have a drink on a bar patio – like popular Gahan House, or sample some beers at Garrison Brewing Company. When you get hungry, hundreds of restaurants, as well as the Seaport Farmers Market, can satisfy your every whim, and that includes a lot of seafood. Or you could take a food tour. True to their reputation, Haligonians (that’s what Halifax’s inhabitants are called) are a friendly bunch. They’re very approachable and easy to talk to, so even if you’re an introverted solo traveler like me, you’ll still end up having conversations with locals, especially if you’re having a drink somewhere. If you can pull yourself away from the sea and the seafood, there is a lot of history to be discovered at the Maritime Museum of the Atlantic. The two main events you will learn about are the Halifax Explosion (1917) and the sinking of the Titanic (1912). Many of the Titanic’s passengers ended up in Halifax, both survivors and those less lucky. The Fairview Lawn Cemetery (in the North end of town) is the final resting place of 121 of the fated ship’s victim. Like elsewhere in Canada, summer is the season of festivals. 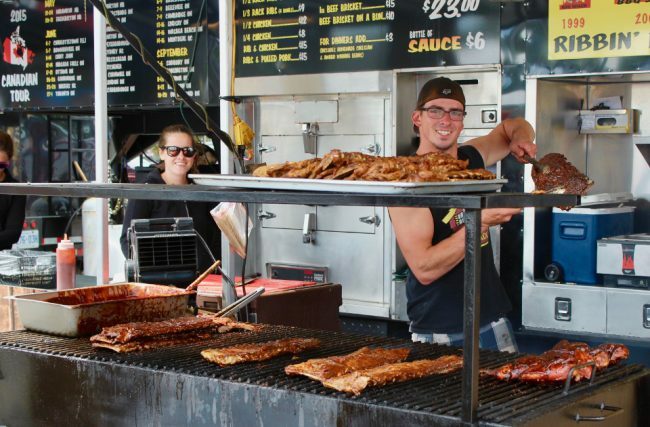 Whether it’s RibFest, the Jazz Festival, or the International Busker Festival, you won’t be suffocated by crowds here, like in larger cities. And finally, public buses crisscross the city for easy transportation, and a ferry takes you across the harbour to Dartmouth, for the best views of downtown Halifax. 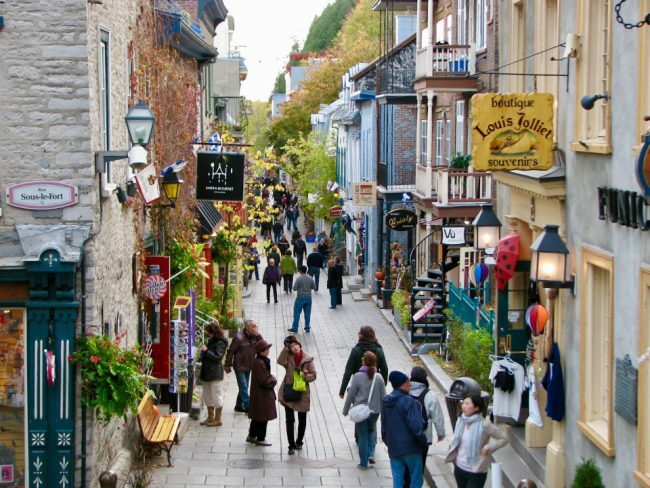 Quebec City is like nowhere else in North America. Over 400 years old, the historical town centre transports you back to Europe with its 17th and 18th century French stone buildings and cobblestone streets. It is also the only fortified city north of Mexico whose walls still exist. The Old Town is divided into Haute-Ville and Basse-Ville, reflecting the division between a higher and lower part. Don’t worry though, they’re linked by a funicular if you don’t want to climb stairs. Looking down into the Basse-Ville at night feels like you’re looking at a fairytale village, or a movie set. Although the Old Town is compact, the whole city counts around 532,000 inhabitants and the metropolitan area totals more than 800,000. Yes, it is touristy in summer, and if you stick to the Old Town you’re likely to hear more English than French. During the entire warm season, musicians, acrobats and actors in period costumes wander the streets. The New France Festival in early August takes it all to a whole new level with parades, concerts, fireworks, and dancing, and of course lots of people in costumes recreating every aspect of life in New France. If you don’t want to share the city with so many tourists, you could choose to go in quieter months such as May and October, but make sure to bring warm clothes. Temperatures can skim the freezing mark at night in mid-October. 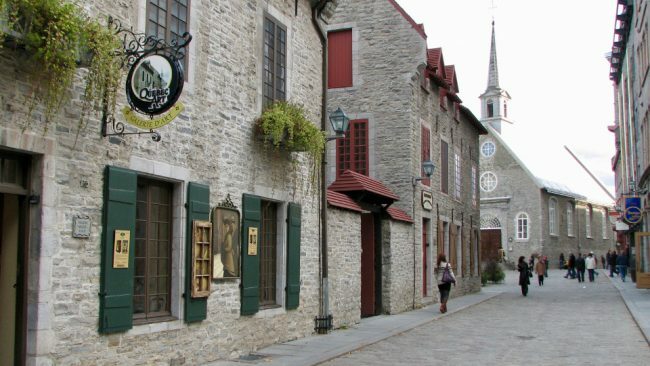 Or you could leave the Old Town and visit the Saint-Roch district (take a food tour) or Montcalm neighbourhood near the historic Plains of Abraham. Talking of food, make sure to try some Québécois specialties while you’re here (hearty meaty fare like tourtière or venison) which you won’t find in the rest of the country. 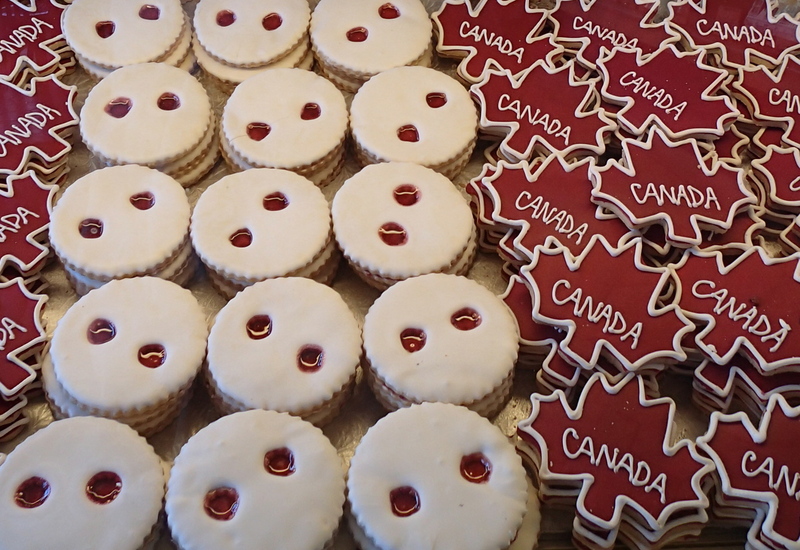 And don’t forget pastries; you’re in Quebec after all! Quebec City also does craft beers very well and hosts several beer festivals throughout the year. If it’s history and culture you’re interested in, make sure to visit the Musée de la Civilisation and the Citadelle de Québec (military history). And if you can’t afford a room at the Chateau Frontenac, you can always go in for afternoon tea! 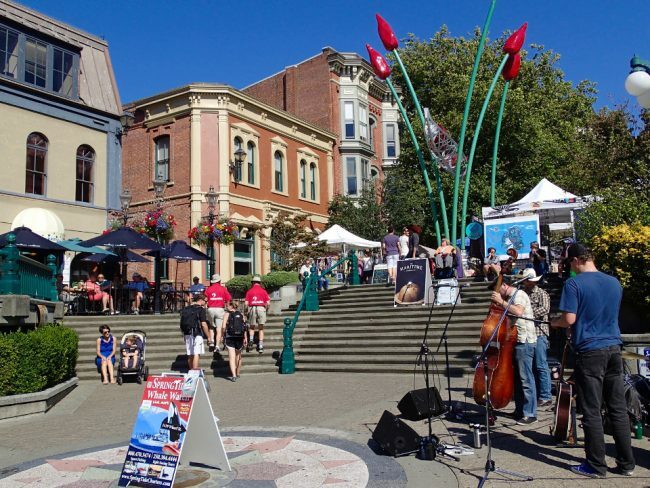 Located on Vancouver Island, at the far western edge of the country, Victoria has a different feel from eastern cities. It has the smallest population of my three cities (less then 86,000 people in the city proper; 368,000 in the larger metropolitan area), but it feels quite expansive, perhaps because of it low buildings, parks, and many bodies of water. It’s also one of the Canadian cities with the most “British” feel, but the locals display a small-town kind of friendliness. Rare frost and decent amounts of rain endow Victoria with many flower gardens, the most magnificent of which is of course Butchart Gardens (with an admission price to match). Other gardens like Beacon Hill Park can be enjoyed for free, however, and you’ll see lush shrubs and flower beds on peoples’ lawns. Victoria may not have as many restaurants as Halifax or Quebec City, but the variety and quality of the food offered is impressive. Being so close to the ocean, seafood is prominent of course, but also Asian cuisines such as Japanese, Chinese, and Thai. Instead of Happy Hour, you’ll often spot “3 to 5 – a buck a shuck” oyster feasts! Go back to a restaurant a second time, and the staff will likely remember you. Fairmont Empress Hotel. Afternoon tea anyone? 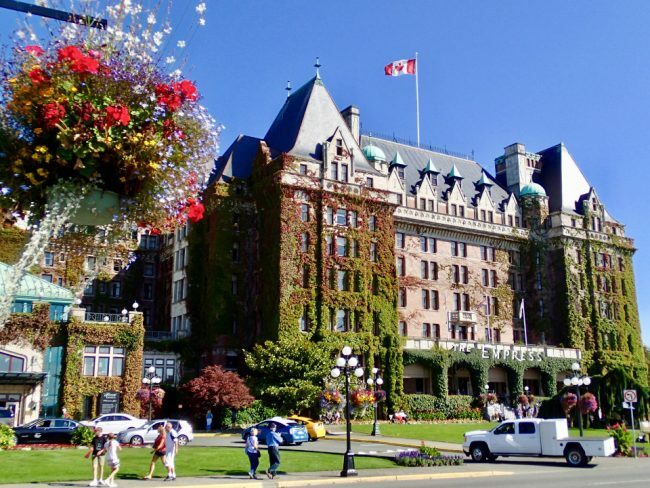 While Quebec City has Chateau Frontenac, Victoria has the Empress Hotel, which, would you know it, also offers afternoon tea. Both hotels share a similar history, having been built by Canadian Pacific, and now belonging to Fairmont. What it lacks in history, Victoria makes up in natural wonders. Its main museum, the Royal British Columbia Museum, is by far the best museum of natural and cultural history in Canada. And you don’t have to go far out of downtown to come across hiking trails (try Lone Tree Hill, for great views) and rocky beaches (such as Willows Beach in Oak Bay). Native American history and culture is also very close to the surface here, with related exhibits and totems dotting the city. Since 2014, there is also an Aboriginal Cultural Festival taking place in mid-June. Victoria also has a special place in my heart, because this is where I enjoyed my first house-sitting experience! Lonely Planet put Canada as its #1 country on their “Best in Travel 2017” list, and our dollar has lost ground against many currencies (including the $US, Euro and Pound). Plus, it’s finally gotten warm, so what are you waiting for? Go book those plane tickets now! Are there other midsize Canadian cities that you’d like to recommend? I have visited all three. Another point of interest in Halifax is the Citadel. Quebec City I have been many times but it has been quite awhile since I was last there. Victoria I visited in high school with a band exchange trip and also for a couple of hours during our Alaskan Cruise. I remember the beautiful gardens. All three are beautiful cities. Perhaps time to revisit Quebec for me. Yes, I feel like I should revisit Quebec City too. Haven’t been there since 2010. Also curious about New Brunswick and NewFoundland, the only two provinces I haven’t visited yet.